The 20th of March, 2010 marks the seventh anniversary of the US invasion of Iraq. After seven years, over 100,000 dead Iraqi citizens, 700+ billion dollars and almost 5000 US soldier deaths later, what does the American Empire have to show for its expense? Not much. Iraq, even still is a county ruined and torn apart by war. Power in Baghdad is often only on one or two hours per day, crime and ethnic violence are still rampant, and much worse. That country, so rich in oil, is now in debt—a large debt too. The oil fields themselves have been mainly privatized and although they are pumping oil, the efforts of the American exploiter corporations in Iraq are hampered by the heroic efforts of the Iraqi Resistance. In these past seven years it has been remarkable how much the original reasons behind the invasion have been widely proven to be a lie. By now, everyone knows that the so-called Global War on Terror has nothing to do with terrorism, the Taliban, democracy or womens’ rights in the Middle East. It is also common knowledge that Iraq held no responsibility for attacks against the US, and that the old WMD claims of Saddam’s government possessing biological and nuclear weapons was a lie. 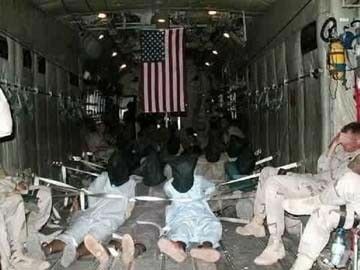 Let’s discuss the fact that the US government stated it was “freeing” a subjugated people. We need not look far to disprove that. Despite claims of “fighting radical Islam,” Saddam’s Ba’ath Party was a secular party throughout its history. The US supports the Saudi Arabian monarchy financially, politically and militarily. The United States and the Bush Administration did not enter the war because it was liberating anyone. Iraq was also not filled with “terrorists” until a military coalition invaded it. The former Administration of George W. Bush seized the opportunity after the events of 9/11 to launch an occupation against two nations and interfere in several more. The US government assembled a military coalition to secure the economically and strategically crucial Persian Gulf. Iraq’s military and civilian infrastructures have been mostly obliterated by sustained military bombardment and on-the-ground invasion. Predictably, this involved overthrowing Middle Eastern regimes that interfered with US corporate interests in exploiting vast oil fields in Central Asia. This has ended in the installation of a “democratic” government hand-picked by US forces, which of course support the ongoing military presence. It’s been seven years since the United States launched its occupation into Iraq, and that means it is time for us to review the numbers. First, take a note. At the time we began writing this article an estimated $712,156,525,787 had been spent on the war. That number is 186,781 dead and 31,616 wounded. This is the human cost of a war propagated by the United States government not for the liberation of a people, but for imperialism and the dawn of a New Age of American Colonialism. By the time we finished writing this article an estimated $712,164,983,347 had been spent. That is $8,457,560 dollars worth of writing. With seven years, 186,781 dead and 31,616 wounded under its belt, need this war, now turned into an out-and-out occupation, continue? It will unless the American people stand up and put a stop to imperialist war once and for all. Troops Out of Iraq! Troops Out of Everywhere! Seven Years of WarThe 20th of March 2010 marks the seventh anniversary of the US invasion of Iraq. And after seven years, over 100,000 dead Iraqi citizens, 700+ billion dollars and almost 5000 US soldier deaths later, what does the American Empire have to show for its expense? Not much. Iraq, even still is a county ruined and torn apart by war. Power in Baghdad is often only on one or two hours per day, crime and ethnic violence are still rampant, and much worse. That country, so rich in oil, is now in debt—a large debt too. The oil fields themselves have been mainly privatized and although they are pumping oil, the efforts of the American exploiter corporations in Iraq are hampered by the heroic efforts of the Iraqi Resistance.In these past seven years it has been remarkable how much the original reasons behind the invasion have been widely proven to be a lie. By now, everyone knows that the so-called Global War on Terror has nothing to do with terrorism, the Taliban, democracy or womens’ rights in the Middle East. It is also common knowledge that Iraq held no responsibility for attacks against the US, and that the old WMD claims of Saddam’s government possessing biological and nuclear weapons was a lie. With seven years under its belt, 186,781 dead and 31,616 wounded, need this war, now turned into an out-and-out occupation, continue? It does, if the American people stand up and put a stop to imperialist war once and for all. In light of all that has been said here and must continue to be said, the American Party of Labor must reiterate the call it began making a year ago during the 6th anniversary of this tragedy. The 20th of March 2010 marks the seventh anniversary of the US invasion of Iraq. And after seven years, over 100,000 dead Iraqi citizens, 700+ billion dollars and almost 5000 US soldier deaths later, what does the American Empire have to show for its expense? Not much. Iraq, even still is a county ruined and torn apart by war. Power in Baghdad is often only on one or two hours per day, crime and ethnic violence are still rampant, and much worse. That country, so rich in oil, is now in debt—a large debt too. The oil fields themselves have been mainly privatized and although they are pumping oil, the efforts of the American exploiter corporations in Iraq are hampered by the heroic efforts of the Iraqi Resistance.